About a week and a half ago, I decided to eat 100% plant-based—a phrase I thought I’d never say! As a meat lover and Thrifty’s ice cream enthusiast, this decision was not easy. However, I knew I had to make a change or I would be frequenting the doctor as often as I frequent Starbucks. Even though I went through a quick 24-hour transition to a strictly plant-based gluten-free diet, I had been mulling over this decision for a few months. Taking antibiotics for the seventh time in nine months was the straw that broke the camel’s back. After doing a lot of research—watching documentaries, reading books, scouring blogs—I found an abundance of information on the correlation between the elimination of animal products in one’s diet and decreasing (if not disappearing) autoimmune disease symptoms. Because of the medicine I take for lupus, my immune system is compromised and susceptible to infections. Even the common cold can lead to a sinus infection or bronchitis, both of which are extremely hard to fight off while taking immunosuppressant medications. All of my research has lead me to believe that switching to a plant-based diet will not only improve my normal bodily functions, but it could reduce my need for medication in the long run. Any decrease in my medication would significantly lower my risk of infection, and maybe I’ll no longer have to be that person who wears masks on planes and obsessively Clorox wipes my shared surroundings. I largely decided to start this blog because I know there will be a lot of life changes that come along with eating 100% plant-based. I am hoping to document my journey of healing from the inside out through wholesome food and wellness practices. With that being said, the past week or so has exceeded my expectations! I was visiting New York City, and I stopped by Le Pain Quotidien for lunch two days in a row! Their vegan and gluten-free options were simple, delicious, and hearty. 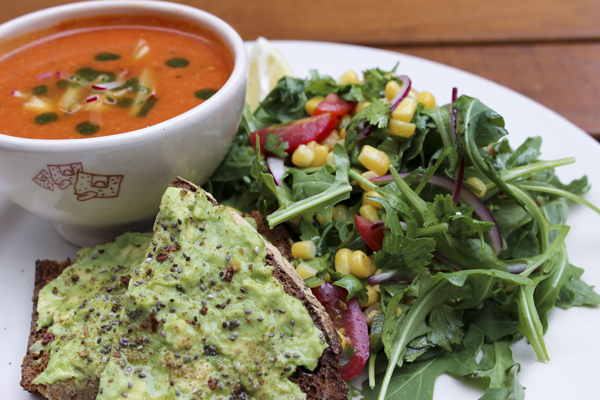 The Baker’s Lunch was my favorite: a bowl of warm tomato soup, a half slice of gluten-free avocado toast, and quinoa tabouli salad! It was more than enough food, and I didn’t feel like I was just eating vegetables. I would highly recommend Le Pain Quotidien if you’re limited by food restrictions or if you just want to try a healthier (yet still yummy) option. Not to mention, the environment is super cute and cozy—oh, and they have locations all over the country!